Dollar for dollar and joy for joy, my most satisfying boat has been a 14-foot fiberglass peapod. 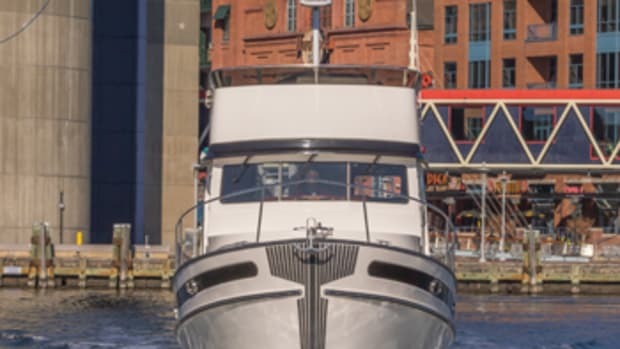 Named for a double-ended garden vegetable and likely descended through the proud lineage of Viking ships, this humble little boat continually reminds me that for the pure pleasure of getting out on the water, keeping it simple is the way to go. With the peapod there is never a muss or a fuss, a missing part or an unexpected expense. I’ve come to imagine her like a gift of jewelry — a marvelous find in a small package. 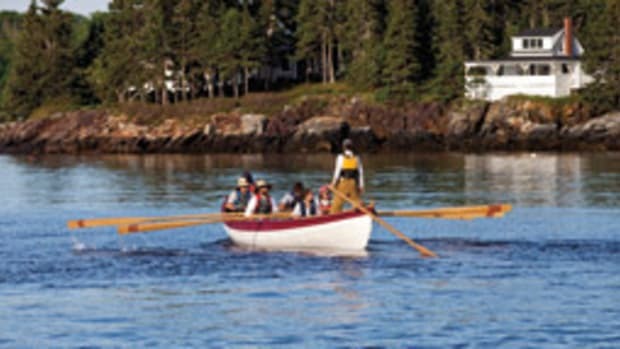 For me, rowing means more hours on the water, more lollygagging through the islands or poking once again along the well-known rim of my homeport, Portsmouth, New Hampshire. Rowing connects me to a place, no matter where I launch, and to the watermen who knew that place before my time. It means getting physical for a while. And feeling the boat run. That run — the travel between each stroke — is a magical sensation, only possible in a rowing boat with a serious waterline. It’s got to be felt to be believed. I’ve been laying down miles along the coast of New England in my peapod and other fine rowing boats for years, and that clean, sweet run still prompts smiles every time. My father taught me to row around 1960. Our family vacation that year brought us to a Massachusetts motel whose pond out back had a rickety dock with a few slab-sided wooden skiffs. I’d like to say this was the magical moment when father introduced young son to the joys of boating. The truth is that Dad had a boat at home, a Town Class lapstrake sloop, and I was already smitten. The clunky skiffs at the motel were anything but inspiring. I got the hang of rowing and experienced a 6-year-old’s satisfaction. But it was all about the accomplishment. There was no thrill. 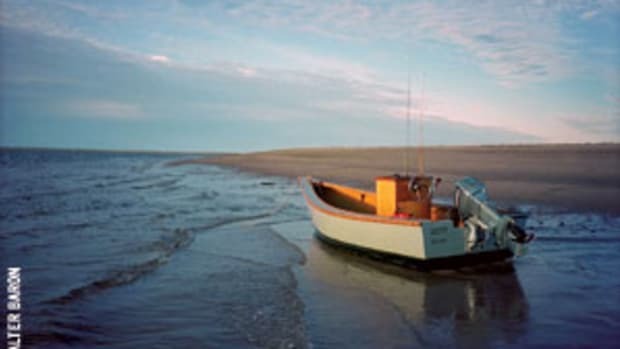 So, too, was the case with the uninspiring rowboats at camps I attended, and the plywood pram we took to Dad’s mooring on the Five Mile River in Rowayton, Connecticut. The joys of rowing, still all in the future, almost slipped away. Rowing clunky boats with short oars or — even worse ­— unresponsive boats with oars that don’t feather is pure drudgery, almost as bad as rowing an inflatable whose outboard has died. There is no magic. For the most part, rowing is ignored these days. Or it has a bad rap. Most of us would agree that although the dinghy dock is full of functional boats, it’s not the place to look for inspiring ones. Outboards and inflatables have their place, but they are no substitute for the wondrous moments to be savored in a fine rowing boat. A quick search on the Web reveals scores of fine boatbuilders producing variations on classic rowing boats for those who want to leave the hard work to the experts. If you’re brave and somewhat handy, you might consider building your own. WoodenBoat (woodenboat.com) is a great resource for small-boat builder information but also provides resources on a range of kits for those interested in building a boat of their own. Here are a few options to consider. 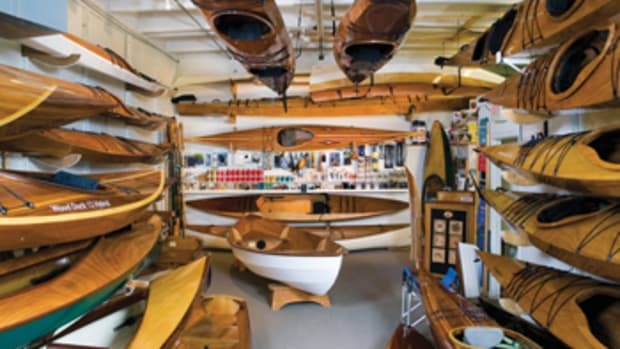 Chesapeake Light Craft clcboats.com Based in Annapolis, Maryland, Chesapeake Light Craft offers more than 100 boat kits, including 15 rowing boats. Choose from an assortment of classic prams, dories, wherries and skerries. Devlin Designing Boat Builders devlinboat.com More than a half-dozen rowing boat kits are available from the Pacific Northwest designer and builder, who pioneered the stitch-and-glue technique. Arch Davis archdavisdesigns.com This Maine boatbuilder offers a number of precut kits with detailed instructions for the ambitious do-it-yourselfer. Pygmy pygmyboats.com Another West Coast builder, Pygmy offers the ultra-light and strong Wineglass Wherry in a stitch-and-glue kit. My reprieve came in college. A friend built a Swampscott dory. Finer-lined than the dories carried aboard Gloucester fishing schooners, it slipped right along, though my technique was far from elegant. I enjoyed the exercise, the quiet and the way the boat surged as I planted the oars. And I felt connected to fishermen and sailors past, an unexpected bonus. So when I landed the ultimate college summer job, skippering Niliraga, a 43-foot 1928 Alden schooner yacht built by Goudy & Stevens, out of Northeast Harbor, Maine, the 14-foot fiberglass peapod we towed as a tender melted my heart. Docile on the end of a long tether, she danced along in our wake no matter the breeze and sea state. By then I had learned the niceties of an oarsman’s stroke. That peapod could be a spirited racer one moment, a reliable draft horse the next. Rowing alone, unhampered by gear, she flew. But load her up with groceries and gear, or with block ice and crew, and she simply settled on her lines, shrugging off the payload. One threatening afternoon I carried a kedge anchor away from the schooner to secure our position in a narrow channel, paying out the rode as I went. Peapods are initially tender, and there is a knack to executing a maneuver like that solo and under oars. Somehow the anchor, chain, rope and oars all played their proper roles at the proper time, earning us a passing lobsterman’s nod of approval. But nothing compared with slipping quietly out of my bunk in the temporary chill of first light, before anyone was stirring, and prowling Maine’s creeks and coves in that peapod, alone but for the eiders and an occasional mink. Sometimes solitude pays dividends. In Merchants’ Row off Stonington, I skirted boulders dressed in barnacles and bladderwrack, ran along short, rocky shores and glided around inviting points, never quite sure what was next. The open bay fronting Roque Island’s crescent sand beach provided challenges of a different sort — long, uninterrupted stretches when I could lean into the oars. The muffled groan of leathered oars in bronze oarlocks and the ripple under that able little boat’s forefoot are with me still. By the end of the summer, that peapod had made me a lifetime rower. Once I had committed to rowing for the sake of rowing, my eye began to wander. A Whitehall, for instance, with its wineglass transom and jaunty plumb stem, is drop-dead beautiful in wood or fiberglass. Favored livery boats at Manhattan’s Whitehall Street during the 19th century, they are efficiently driven — precisely what you would expect in a human-powered water taxi. Their long, straight keels make them track exceptionally well. As with all rowing boats, length matters. Settling into a 17-foot wooden Whitehall with a pair of spoon oars, I found Northeast Harbor’s scenery flying by. We had a pair of fiberglass Whitehalls on a big commercial schooner that I later ran, and I rowed them frequently in the turquoise waters of the Bahamas and Virgin Islands. One memorable Sunday, anchored in Tongue of the Ocean, east of Andros Island, three of us put on shore clothes and took the Whitehall to church in a tiny out-island village. We pulled for more than a mile in a whitecapped, quartering sea toward a small white chapel in a grove of palms. Salt spray and sun starched our clothes, but that didn’t matter to the Bahamians. They welcomed us warmly and recounted how in the old days, plenty of people went to church by boat. 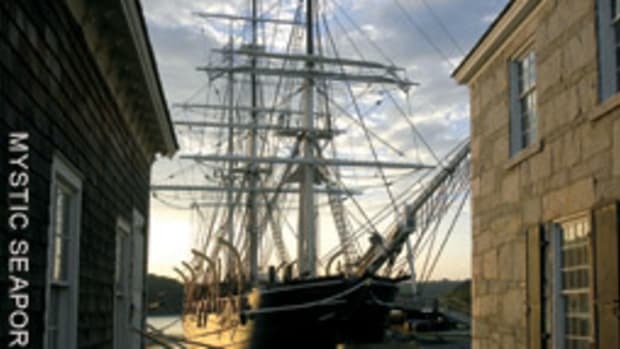 Exquisite wooden Whitehalls and other traditional small craft are available for rent at Mystic Seaport’s Boathouse Rentals in Connecticut. I make it a point to row there every summer. The opportunity to experience a variety of boats from the museum’s small-craft collection is too good to pass up. Strength helps if you want to row well, but there are tricks to clean rowing that need not depend on brute force. The moment you put the blades in the water and apply power is called the “catch.” Go for it. Brace your legs, then swing with your back. Squeeze your arms. The boat will surge. As you finish the stroke, with the oar handles near your chest, a slight downward pressure lifts the blades from the water. This is when your satisfaction hangs in the balance. A steady, controlled recovery — pushing the oars away from your body as you begin to bend forward for the next catch — allows the boat to run. That’s the magical moment. Anyone can get a boat to surge on the power stroke. During the recovery, she runs. If you maintain your balance, steady as she goes, you almost get something for nothing. Clean rowing is a mixture of rhythm and balance. As the endorphins kick in, there’s a rush like that from running, cycling or swimming. What’s not to like? It’s the rhythm that connects me to my surroundings. Catch, power stroke, recovery, run — that rhythm forges the rower, the boat and the water into something nearly perfect, something greater than the sum of its parts. Many years after that summer job aboard Niliraga, my wife and kids and I began to cruise northern New England and New Brunswick in a classic 36-foot yawl designed by K. Aage Nielsen and built by Paul E. Luke in East Boothbay, Maine. When it came to selecting a tender, only a peapod would do. A boatbuilder in Alton Bay, New Hampshire, was producing what he called a Rams Head peapod. A bit beamier than the one on Niliraga, our peapod has built-in flotation under the bow and stern seats. She can be rowed from amidships or from forward, depending on the load and trim, and she tows beautifully. We logged 750 days in our old yawl over 14 years, towing that peapod every mile. Some cruisers refuse to tow a tender. That relegates them to short dinghies that fit their davits or an inflatable with an outboard. Though I won’t tow a tender offshore, I can’t imagine coastal cruising without a sweet rowing boat. We towed the peapod without a shred of regret. And I always knew that if things went really sour she would see the family through as a lifeboat. I had confidence in her lineage. 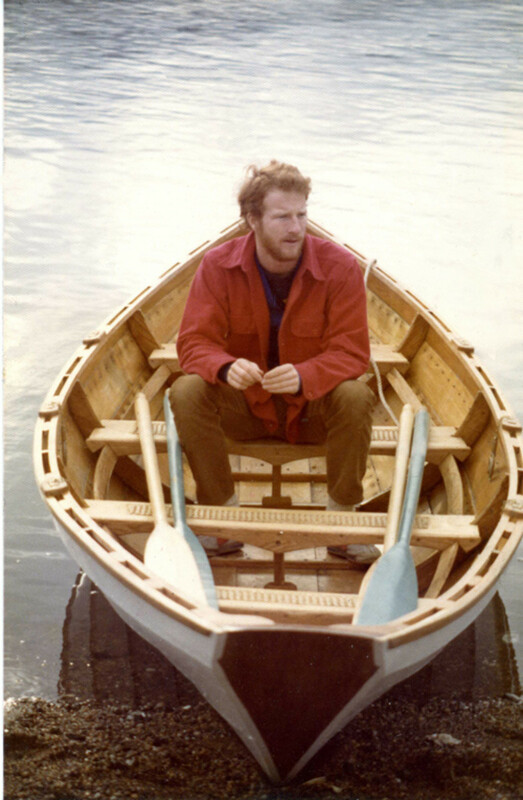 Our kids grew up in that peapod, a cocoon of well-worn fiberglass framed by weathered ash seats and gunwales. 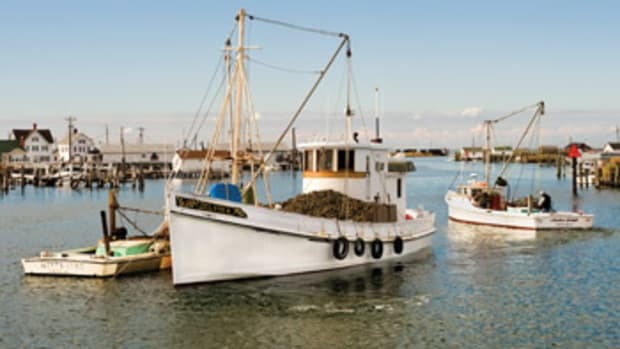 With a proper boat under them, they came to own every harbor and cove on the coast. Whether reconnoitering abandoned granite wharves or collecting flotsam and jetsam to build a raft, their peapod taught self-reliance and boat sense. For Northern boaters, whose big vessels are under shrink wrap for much of the year, rowing means boating year-round. Many a Christmas Eve or New Year’s Day has found me on the water. My wife is always game. 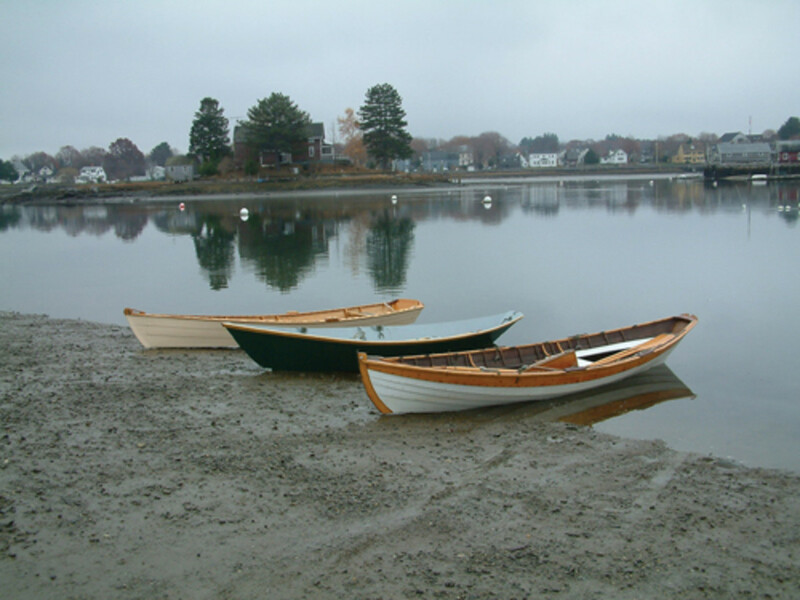 For rowing double, our boat of choice is a 17-foot Piscataqua River wherry with spoon oars. A close cousin of the dory, the Piscataqua wherry is finer and more slippery. Wherries were the water taxis between Portsmouth, New Hampshire, and the Portsmouth Naval Shipyard until the Memorial Bridge was built in the 1920s, and they handle the whirlpools and standing waves in that cross-grained river with aplomb. An elegant wooden boat traditionally built of cedar over oak with copper rivets, our wherry is fetching and easily rowed — but nowhere as carefree as that old fiberglass peapod. 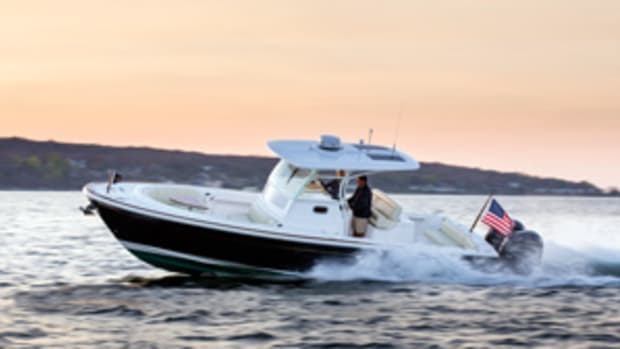 It’s a classic boater’s trade-off: beauty versus simplicity. Recently I’ve had access to a new ride, a different Piscataqua wherry, courtesy of the nonprofit Gundalow Co. Lighter and more tender than the one we own, she is a lovely boat. I was back on the river quite a bit this summer, working the back eddies, seeing the same old sights from a new perspective and bucking the current. There are points on the Piscataqua River I can’t pass when bound upstream against a strong flood, such as the red day marker in Eliot, Maine, no matter how I work the eddies or time my stroke. But even when I don’t prevail, stemming that tide (one of the strongest in the nation) always means a splendid sensation of exhaustion and accomplishment. There have been moments over the years when, with a sore bum and an aching back, I wonder why I still row. Then I remember the gray seal spy-hopping in the peapod’s wake, the glint of the low winter sun on the wherry’s varnished oars and the flush of triumph after circumnavigating a sizable island. Call me a fool, but I’m committed. Rowing’s the way to go. That clean, sweet run is too good to miss. This article originally appeared in the October 2016 issue.